Sunday, July 15 was National Ice Cream Day! Although “National Ice Cream Day” might sound made up, it’s a real holiday! President Ronald Reagan made it an official holiday 34 years ago, not only declaring the third Sunday of July as National Ice Cream Day but also proclaiming the month of July as National Ice Cream month. Even without an official holiday to promote the consumption of ice cream, July’s hot temperatures and proliferation of outdoor celebrations make ice cream a popular treat. According to small business software provider Womply, July is the number one sales month of the year for ice cream and frozen yogurt businesses. Plenty of popular ice cream retailers embraced the holiday this year with deals and freebies. Baskin Robbins members with the company’s mobile app took advantage of special offers like buy-one-get-one-free cones, two dollar discounts on medium milkshakes and $.99 sundaes with the purchase of one at regular price. Whole Foods offered customers two pints of Ben & Jerry’s or Talenti ice cream for $6.00 with further discounts for Amazon Prime members. Some PetSmart locations even had free dog-safe ice cream for our canine friends to enjoy! Here in Mint Hill, Sticks and Cones truck owner Karen Trauner opened her new truck, Andee, for an impromptu National Ice Cream Day Celebration. 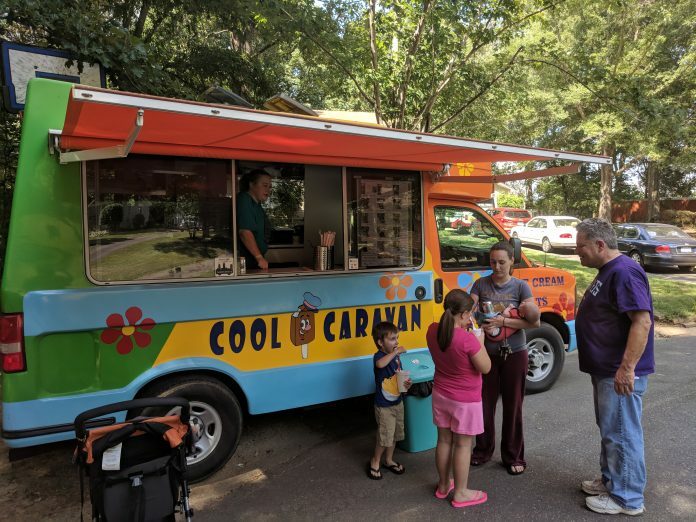 People who visited the truck parked in her cul-de-sac between 3:00 and 4:00 on July 15 received free root beer floats. After they closed up shop, Trauner took the truck on the road and delivered root beer floats to Mint Hill and Idlewild Fire Departments. All in all, Trauner gave out about two dozen root beer floats and a dozen cups of vanilla ice cream. “We had a really good time, and we might do it again in the future just for fun!” said Trauner.